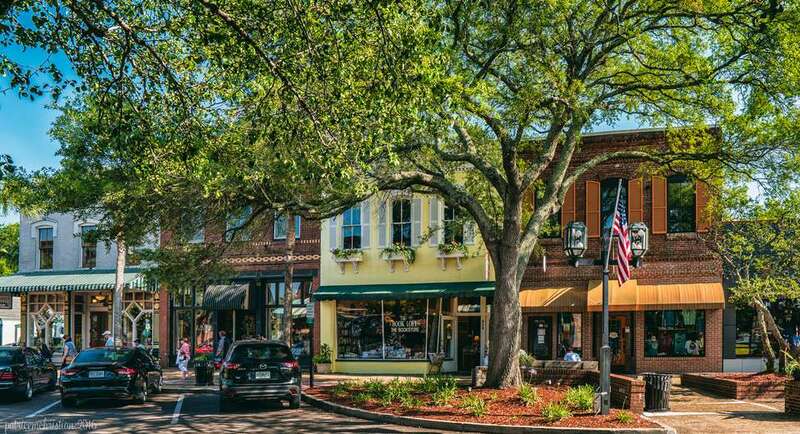 When you visit downtown Fernandina Beach, there's nothing quite like a sunny day to stroll the sidewalks while shopping at the quaint stores. Fernandina Beach is located along the coast of Northeast Florida on Amelia Island, situated on the St. Marys River just south of the Florida-Georgia border and not far from the waters of the Atlantic Ocean. Fernandina Beach has an overall average high and low temperatures of 77 and 61 degrees Fahrenheit (25 and 16 degrees Celsius). The highest recorded temperature in Fernandina Beach was 104 degrees Fahrenheit (40 degrees Celsius) in 1950 and the lowest recorded temperature was a very chilly 4 degrees Fahrenheit (minus 15 degrees Celsius) in 1985. On average Fernandina Beach's warmest month is July, and January is the average coolest month while the maximum average rainfall usually falls in September. If you're packing for a vacation or getaway to Fernandina Beach on Amelia Island, remember that locations near the water tend to be a bit cooler than locations further inland. Still, expect it to be quite warm in the summer, but much cooler in the winter. From June 1 to November 30 is the official Atlantic Hurricane Season, which affects most of the state of Florida. Although Fernandina Beach is a little further inland and hasn't seen as many hurricanes as more southeastern parts of the state, you should still be prepared for a sudden severe storm if you plan to visit during this volatile season. Evacuations are not common but may be required if a hurricane or strong tropical storm are heading directly for Fernandina Beach. Both warm and relatively dry, spring in Fernandina Beach is the perfect time to visit if you're looking for a chance to enjoy the sand without all of the crowds of summer. With an average temperature of 68 degrees Fahrenheit (20 degrees Celsius) for the season and a high of 83 F (28 C) in May, spring truly is the ideal time to visit northeastern Florida. You'll also only encounter six to 10 days of rain each month, totaling a little under 15 inches of rain from March through mid-June. What to pack: If you're visiting in March or April, you may still need to pack a light sweater or jacket for colder evenings, but if you're visiting in May or June, you may want to pack an umbrella and raincoat to accommodate the coming wet season. Of course, you'll also want to bring all your beach-going attire like swimming trunks, tank tops, sandals, and sunscreen, but you'll also need to pack a few layers in case of another burst of winter chill. Although it's the hottest season of the year, summer is also an extremely wet time for much of the southeastern United States, largely due to the arrival of hurricane season and its accompanying tropical storms. Still, with average high and temperatures of around 90 and 73 degrees Fahrenheit (32 and 23 degrees Celsius), you truly can't beat a sunny day in June through mid-September in Fernandina Beach. However, you'll have to check the weather frequently to find a cloudless day since you can expect between 11 and 13 inches of rain per month throughout the season. What to pack: You can leave the jackets and sweaters at home most of the summer, but be sure to pack a raincoat and umbrella no matter what month you're visiting. You'll also want to bring water-resistant footwear along with all of your beach gear—in case you happen upon a sunny summer day. The rains continue into September and October, but dry up by the end of the season well before southwesterly cold fronts bring winter's chill to the state. Temperatures begin dropping in mid-October, though, and by Thanksgiving, you can typically expect nightly lows of around 55 degrees Fahrenheit (13 C). Daytime highs throughout the fall range from 85 in September to a cool 72 degrees Fahrenheit (29 to 22 degrees Celsius) in November, and rain is expected between 7 and 12 days a month during the season. What to pack: While the rains have typically subsided by the end of fall, you'll still need to bring an umbrella and raincoat and keep an eye on the weather during your autumn trip to Fernandina Beach. Be sure to also pack a light sweater, especially if you're traveling in October or November, and plenty of light daytime wear to accommodate for sunny days. As temperatures continue to fall from mid-November through mid-January, the rain also subsides throughout much of the region, resulting in plenty of cloudless winter days with temperatures between 60 and 65 degrees Fahrenheit (16 and 18 degrees Celsius). However, average monthly low temperatures drop from November through January before slowly climbing back up in February. You can expect between seven and nine days of rain each month throughout the winter season, and while snow is rare, it has dusted the area. What to pack: Long pants and a sweater might be necessary for the winter. Also, make sure you pack a warm jacket for those cool to cold winter nights, especially if you're taking a scenic night tour or a moonlit cruise.